Since Downton Abbey is set to bow after its upcoming sixth and final season, PBS is determined to make hay while the sun shines. It has scheduled its U.S. Civil War drama, Mercy Street, to air Sunday nights, after Downton, to capitalize on the British drama’s popularity. Directed by Roxann Dawson and Jeremy Webb, Mercy Street is a production of Sawbone Films and Scott Free Productions. Executive producers: Ridley Scott, David W. Zucker and co-creator Lisa Q. Wolfinger; co-creator and writer David Zabel; co-executive producer Clayton Krueger; and producer David Rosemont. Mercy Street stars Mary Elizabeth Winstead as Nurse Mary Phinney; Josh Radnor as Jedediah Foster; Gary Cole as James Green, Sr.; Peter Gerety as Dr. Alfred Summers; Norbert Leo Butz as Dr. Byron Hale; McKinley Belcher III as Samuel Diggs; Shalita Grant as Aurelia Johnson; and Hannah James as Emma Green. Cherry Jones guest stars as Dorothea Dix. Mercy Street premieres Sunday, January 17, 2016. Check your local listings. Read on for more from PBS. Filmed on location in Virginia, the six-part series is the first American drama to air on PBS in more than a decade. The series will join a robust Sunday night drama lineup on PBS in winter 2016, including the final season of “Downton Abbey” on MASTERPIECE. What do you think? 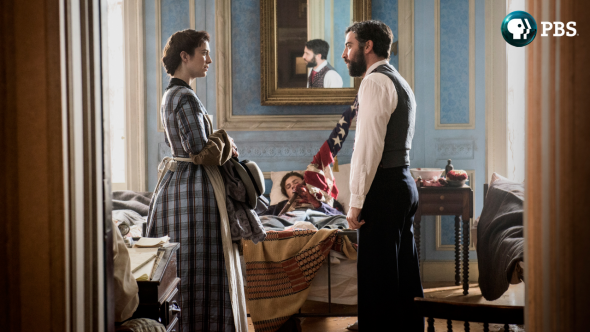 Do you like the sound of the new PBS TV show, Mercy Street? Will you stay tuned after Downton Abbey, to check it out? If you don’t watch Downton, do you plan to check out Mercy Street, anyhow? Tell us what you’re thinking, in the comments. More about: Downton Abbey, Downton Abbey: canceled or renewed?, Mercy Street, Mercy Street: canceled or renewed?, PBS TV shows: canceled or renewed? Please, please renew for season 2! Husband amd I have watched every episode. It’s amazing to see the medical devices they used. We love this series please keep it going. I look forward to seeing it. I’m glad Downton has drawn people to PBS. Your comment is unfair. There are legions of us who watched PBS Masterpiece Classic, Modern and Mystery for years before Downton Abbey came along.